Rated 4.0 out of 5.0 based on 171 surveys. Comprising three guest-room towers, the Disneyland Hotel is lushly landscaped with a vintage Disneyana theme and offers large, luxurious guest rooms. Walking time to the Downtown Disney Monorail Station, with transportation to Disneyland Park, is about 3–6 minutes. After the Grand Californian, the next most convenient is the sprawling Disneyland hotel, the oldest, but most recently renovated, of the three Disneyland Resort Hotels. The Disneyland hotel consists of three towers facing each other across a verdant landscaped plaza, a swimming complex, restaurants, shops, and gardens. The hotel was originally connected to Disneyland Park by monorail, but a portion of the hotel was demolished during the construction of DCA and Downtown Disney, and the station was rebuilt on its original location. Guest registration for all three towers is situated in the Fantasy Tower (previously called the Magic Tower, and the Marina Tower before that), which is connected to the Disneyland Convention Center and Disneyland hotel’s self-parking garage. Though all three towers share restaurants, shopping, and recreational amenities, the Fantasy Tower is most conveniently located. It and the Adventure Tower (formerly Dreams, née Sierra) are closest to Downtown Disney and the theme parks. The Frontier Tower (formerly Wonder, formerly Bonita) is the farthest from the action. Mousesavers.com has a list of discounts and deals available at Disneyland Hotel. Rack rates for the Disneyland hotel range from around $410 for a city view in the off-season to more than $720 for a theme park view during holiday periods. The best views can be had from the east/ west-facing Adventure Tower, which overlooks the hotel’s inner plaza and pool area on the west and Downtown Disney and the theme parks to the east. The most lackluster views are the north-facing vistas of the Fantasy Tower. As concerns practical matters, parking is a royal pain at the Disneyland hotel. The self-parking garage is convenient only to the Fantasy Tower, and even there you’ll probably have a long walk. To reach the other two towers, you must pass through the Fantasy Tower and navigate across the hotel’s inner plaza and pool area. The Frontier Tower on the southern end of the property has a small parking lot to the rear accessible via Downtown Drive and Paradise Way. Unfortunately, many of the already limited spaces are reserved for the adjacent Disney Vacation Club time-share sales office. Even so, if you’re staying at the Frontier Tower, it’s your best bet. If there’s no room in the Frontier lot, you’re better off parking in the Paradise Pier hotel’s lot than in the Disneyland hotel parking garage. The only valet parking is at the Fantasy Tower, so even if you valet park, you’ll still have to hoof it to the other towers. I initially thought that staying at the Disneyland Hotel was a nice treat that we might do just this once. I now see it as an absolute necessity as it allows early entry and an easy midday retreat. That plus the great service there seals the deal. One final tip: Although the rooms don't have a kitchenette, you can request a refrigerator and a coffeemaker. We used the coffeemaker to heat water for instant oatmeal and kept juice and milk in the fridge for quick breakfasts in the room. Like the Grand Californian Hotel & Spa, the Disneyland Hotel charges a $20 per night for the privilege of self-parking, or $30 for valet. The theme of Disneyland Hotel is based heavily off of Disneyland's history, with rooms featuring vintage pictures of Walt Disney in the park, as well as classic Disneyland artwork from the early era of the park. As for as amenities, the rooms tend to be a bit smaller than the other hotels, but the quality is very high. Guests at the Paradise Pier, Grand Californian, and Disneyland Hotels can enter on any early-entry day, as long as they have any valid ticket; this privilege is referred to as Extra Magic Hour. During this early-entry hour, most of the Fantasyland attractions—along with Space Mountain, Finding Nemo Submarine Voyage, Astro Orbitor, Buzz Lightyear, and Star Tours in Tomorrowland—will usually be open. The rest of the park’s attractions (and all Fastpass machines) will remain offlimits until the official opening time. Disney California Adventure (DCA) also offers its own Extra Magic Hour exclusively for hotel guests, offering access to all of Cars Land, along with select attractions in Hollywood Land, Pixar Pier, Paradise Garden Park, and Grizzly Peak, on 3 mornings (Monday, Wednesday, and Friday) or daily, depending on seasonal demand. Walt Disney barely managed to finance the construction of the Disneyland theme park. He certainly didn't have the funds to purchase adjacent property or build hotels, though on-site hotels were central to his overall concept. So he cut a deal with petroleum engineer and TV producer Jack Wrather to build and operate the Disneyland Hotel. The deal not only gave Wrather the rights to the Disneyland Hotel but also allowed him to build other Disneyland Hotels within the state of California until 2054. It always irked Walt that he didn't own the hotel that bore his name, but Wrather steadfastly refused to renegotiate the rights. After Jack Wrather died in 1984, the Walt Disney Company bought the entire Wrather Corporation, which among other things held the rights to the Lone Ranger and Lassie TV series and, improbably, the RMS Queen Mary, docked at Long Beach. By acquiring the whole corporation, the Walt Disney Company brought the Disneyland Hotel under Disney ownership in 1988. In August 2009 the Disneyland hotel embarked on an ambitious and long- overdue renovation that included major improvements to the guest rooms, as well as a modernization of the hotel’s exterior. While the hotel was formerly essentially themeless, the renovation has embraced the retro-nostalgia of baby boomer Disneyland devotees and added decorative elements evoking the park’s early years; look for 1950s-style signage outside each tower and a tribute to Frontierland’s long-gone Old Unfaithful geysers. The redesigned main lobby evokes Mary Blair’s It’s a Small World designs, and features a blown-up fun map of the original park. The check-in area sports early attraction concept artwork and seating styled after the spinning teacups, whimsical touches that stand in stark contrast with the ultramodern sculpted steel behind the front desk. Peek inside the Frontier Tower lobby to see an amazingly detailed model of Big Thunder Mountain. A security gate guards the entrance to Disneyland Hotel's grounds. If you arrive by car, you'll need to provide photo ID at the gate; it's not necessary to provide your reservation number or paperwork. A dedicated parking lot across from the lobby serves as temporary parking for those who need it while checking in. Check-in time at Disneyland Hotel is 3:00 PM, and check-out time is 11:00 AM. You'll need to provide a government-issued photo ID and credit/debit card when you register. Get theme park tickets and dining reservations at the Concierge Desk. If you need to check in and obtain theme park tickets, you can save some time in line if one adult gets in line for tickets just after another adult starts the registration process. The Concierge Desk can also make Disney dining reservations, and you can avoid a wait there by making them online prior to arrival. Disneyland Hotel rooms feature a sleek monochromatic contemporary look. Each room has one king-size or two queen-size beds, along with a pullout couch; one-bedroom suites with a wet bar and living room are also available. Features include a headboard with a carving of Sleeping Beauty Castle; fiber optics in the headboard create a skyline with fireworks (accompanied by a tinny rendition of “When You Wish Upon a Star”) at the flick of a switch. Other decorative touches include black-and-white photography depicting the history of Disneyland and hidden Mickey designs in the carpet, though the overall feel is more business modern than Disney whimsy. Each room has a flat-panel HDTV, perfect for connecting a laptop or video game console. 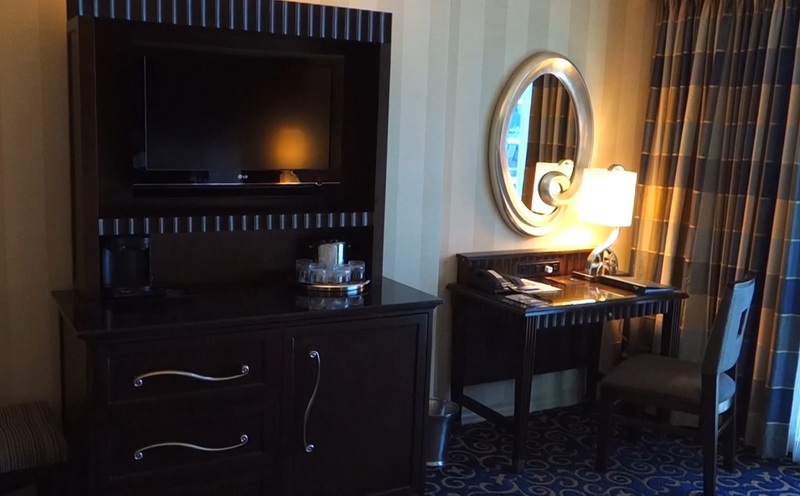 Other room amenities include mini-refrigerators, coffeemakers, safes large enough for laptops, and high-tech phone, cable, and wireless Internet connections. Plumbing, electrical, heating, and air- conditioning systems upgrades also were included in the project. Rooms feature large windows that give the facade a glistening sky-blue tint. The windows, which are specially designed to filter outside noise. A handful of corner suites and penthouses in the Frontier Tower have sliding doors and small balconies. Disneyland Hotel room with a king-size bed. The mini-fridge is a dorm-style unit that sits under a counter or desk. It's more like a beverage chiller than a refrigerator in that it'll keep drinks cool, but you're not going to freeze popsicles or make ice cubes in it. Every room in Disneyland Hotel has a coffee maker. Entertainment center, dresser, and mini fridge. The bathrooms are still small for an upscale hotel, but there is a sink and vanity outside the bathrooms. As in most family hotels built in the 1950s and 60s, a connecting door, situated by the closet and the aforementioned single sink, leads to an adjoining room. Soundproofing around the connecting doors is nonexistent, so be prepared to revel in the sounds of your neighbors brushing their teeth, coping with indigestion, and arguing over what to wear. Fortunately, these sounds don’t carry into the sleeping area. Water pressure in the shower is good. A 1500-watt, wall-mounted hair dryer is provided, but it's not very powerful; bring your own if you've got lots of hair. 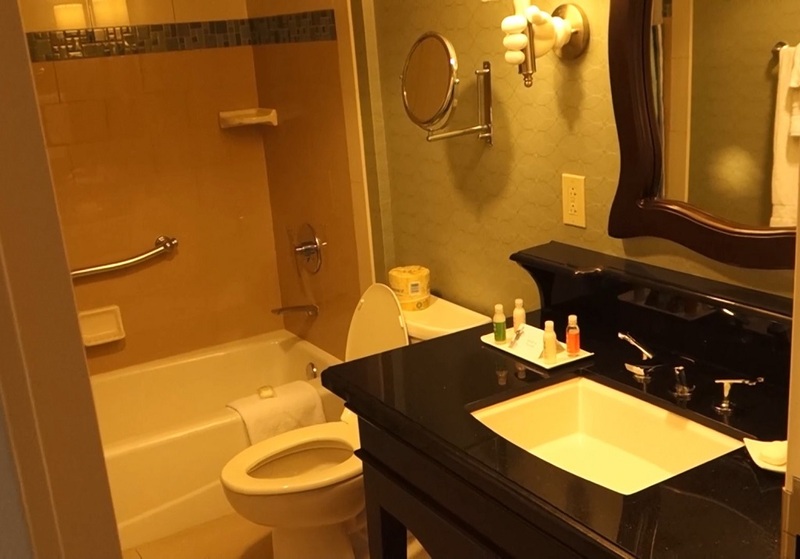 A typical Disneyland Hotel bathroom. Disneyland Hotel has rooms available with various accessibility options. Some feature roll-in showers, while others include assistive hearing devices. Disney knows that some hotel rooms are better than others. Most people prefer to be close to the lobby and dining, and want something pretty to look at from their hotel room window. To capitalize on this, Disney categorizes all of Disneyland Hotel's rooms based on what you see from inside the room. A Standard View room may look out on to a parking lot or one of the neighborhoods next to the Disneyland Resort. A Pool View room has views of Disneyland Hotel's Monorail waterslide and E-Ticket Pool. Resort View rooms feature views of Disneyland and Downtown Disney. The higher your room is, the better your view of the Disneyland will be, but that privilege does come at a higher price (sometimes as much as $100 more, per a night). Rooms with a Resort View also have good views of Disneyland's fireworks show. The original pool has been greatly expanded into an “immersive water play area.” The new complex’s centerpiece is a pair of waterslides (187 feet and 112 feet long, respectively) themed to resemble vintage monorail trains, topped by the classic Disneyland block-letter logo. There’s also a 19-foot kiddie slide and bubble jets for the little ones. While the footprint of the 4,800-square-foot E-Ticket Pool (formerly known as the Never Land Pool) remains unchanged, a new 4-foot-deep pool has been added between it and the new waterslides, with a footbridge allowing easy passage from one side of the water to the other. Unfortunately, the adult-friendly quieter Cove pools were lost in the construction, reclaimed as a grassy space for special events. Though the rebuilt amenities are attractive, they still appear inadequate in light of the hotel’s volume of visitors. On sunny days expect long inefficient lines for the slides, as well as a severe shortage of lounge chairs and elbow room. Disneyland Hotel's pools range in depth from around 3 feet 6 inches/1.1m to 4 feet 9 inches/1.4m. Disneyland Hotel's pools are open every day, including during winter. Pools are heated to 82°F/28°C throughout the year. We've swum in temperatures as cold as 40°F/4°C; the water was fine, but getting out was a shock. Disneyland Hotel also has a hot tub near in the pool complex. Pool hours are at least 9AM to 9 PM, extending to as much as 8 AM to 12 AM during busy times. Lifeguards are on duty during the pools' operating hours. Disneyland Hotel's E-Ticket Pool has a chair-lift device that can lower guests in wheelchairs into the shallow end of the pool. Check with any lifeguard for assistance on using the lift. Disneyland Hotel has one full-service restaurant, one character dining restaurant, two bars and lounges, and two counter service restaurants. If none of these establishments meet your needs you can take a short walk to Downtown Disney and eat at any one of its restaurants of varying quality and price range. It’s a buffet and your chef is Goofy... which should tell you everything you need to know. Breakfast features Mickeyshaped waffles, sausages, pancakes, bacon, scrambled eggs, and other traditional breakfast items. Dinner offers everything from prime rib to premium salads. You come for two reasons: 1) It’s easy and convenient, especially if you’re staying at the resort, and 2) the youngsters haven’t yet had their fill of dining with a rotating cast of Disney characters. Goofy and all his friends always put a smile to kids’ faces. Goofy’s Kitchen, even at the staggering price, was well worth it. The food was really good, a lot of the menu is designed for children, and the character visits are worth the price. What a thrill to see my grandchildren’s delight at being visited by Minnie, Pluto, Chip, and Snow White (with whom my 2-year-old grandson flirted brazenly!). Goofy’s Kitchen serves a character breakfast buffet 7 a.m.–noon (2 p.m. weekends) anda character dinner buffet 5–9 p.m. Goofy, of course, is the head character, but he’s usually joined by Minnie, Pluto, and others. A separate children’s menu featuring kid favorites such as hot dogs, burgers, chicken nuggets, pizza, macaroni and cheese, and spaghetti and meatballs, as well as healthier options such as sliced fruit, yogurt, and whole-grain baked goods. Priority Seating is highly recommended for Goofy's Kitchen. Steakhouse 55 is all about the meat, grilled certified Angus beef seasoned with the restaurant’s signature rub—but you can also order one of the fresh seafood choices or delectable lamb, pork, or chicken. Choose a bottle of wine from an impressive wine cellar, or simply engage one of the numerous sommeliers to choose a wine to complement your meal. This underrated eatery has been a well-kept secret for years and matches many of the more well-known steak houses in the area (Morton’s and Ruth’s Chris) steak for steak. The recent renovation has only made the place more alluring and comfortable, a perfect place to spend a grown-up evening over a leisurely meal matched to premium wines. Longtime chef Jason Martin has had years to refine his menu and has been consistently recognized by local and visiting critics as a bona fide culinary talent. Best to leave the kids behind for this experience; they’ll bore easily and may disrupt what could be one of the best adult nights you’re likely to have during your stay. Trader Sam’s Enchanted Tiki Bar serves exotic cocktails and Asian-inspired appetizers in an intimate and elaborately decorated environment reminiscent of Walt Disney World’s extinct Adventurers Club. Order an Uh Oa, Krakatoa Punch, or Shipwreck on the Rocks to see some explosive special effects. Trader Sam's has a limited amount of indoor and outdoor seating. This becomes a problem on weekends due to the location being extremely popular with locals. It's not uncommon to see lines of over an hour long to get a seat during Disney Marathon and D23 Expo weekends. This is Disneyland Hotel’s poolside tropical retreat. Tiki torches and South Seas music are a dead giveaway that they want to evoke that island feeling. House specialties Breakfast starts with French toast with bacon and banana-caramel sauce or grilled cinnamon-spiced oatmeal cakes. Lunch and dinner feature a one-third-pound Hawaiian cheeseburger with teriyaki sauce, bacon, and grilled pineapple on a multigrain roll. Located near Goofy's Kitchen, The Coffee House features a small selection of coffee and pastries. Driving Your Own Car Disneyland Hotel is just off of the 5 freeway in Anaheim. Take I-5 South Exit on Disneyland Dr and turn left on Disneyland Drive. Go about 0.3 miles and make a right on Magic Way. Drive about 0.2 miles down Magic Way (past the Downtown Disney entrance) and Disneyland Hotel will be on your left. From Los Angeles International Airport or John Wayne Airport If you're arriving at LAX or John Wayne, Gray Line Anaheim's Disneyland Express will take you and your luggage directly from the airport to Disneyland Hotel, then back to the airport when it's time for your flight home. This service is not free and reservations must be made in advance. Prices from LAX are $30 one way/$48 roundtrip for adults, and $22 one way/$36 roundtrip for children. Prices for John Wayne Airport are $20 one way/$35 roundtrip for adults and $15 one way/$26 roundtrip for children. See Gray Line's website for more information. Another transportation option is SuperShuttle. Prices are around $20 per person one way from LAX and $15 per person one way from John Wayne Airport. These prices do not include tip. Taxis are also available at all local airports, but the price can become extremely expensive after sitting in Los Angeles traffic on the way to Disneyland Resort. We've heard reports from people that have paid almost $150 to get from LAX to their Anaheim hotel. 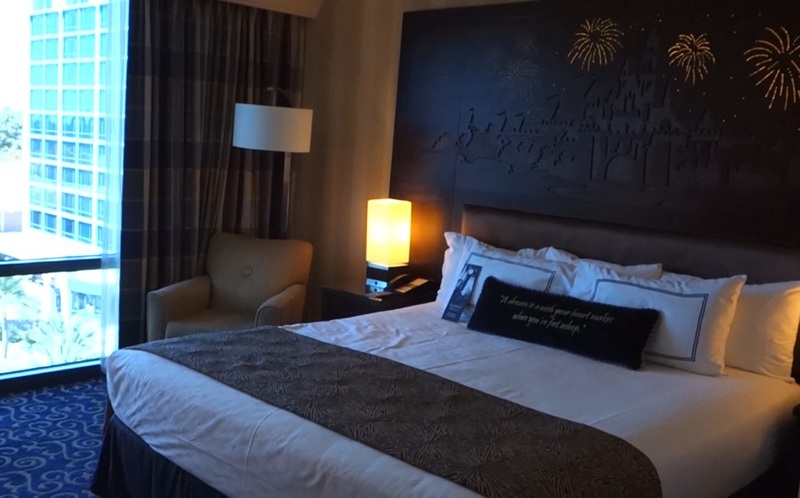 Getting to the theme parks and Downtown Disney: All Disneyland Resort theme parks, hotels, and Downtown Disney can be accessed with a short walk from any Disneyland Hotel room. The walk from Disneyland Hotel to Disneyland or Disney California Adventure usually takes about 15 minutes, depending on how fast you walk. Another option is to take the Disneyland Monorail. Guests who catch the monorail at Downtown Disney will be dropped off at the Tomorrowland Monorail Station. Disneyland Hotel's gift shop is Fantasia Shop and sits just off the lobby. As you'd expect from a Disney gift shop, Fantasia has a decent collection of souvenirs ranging from small trinkets such as keychains and pens, to embroidered jackets and Disney princess dresses. Prices for these items are about what you'd pay in the theme parks or Downtown Disney. Fantasia Shop also sells basic pharmacy items such as sunscreen, aspirin, allergy and cold medicine, baby diapers and formula, shampoo, and the like. And Fantasia Shop has Disney-branded cookies, chocolate, coffee tins, and similar items, if that's what you're looking for. Prices for these items are considerably higher - about double - than what you'd probably pay at home. Coin-operated washers and dryers are in laundry facilities located near the Monorail Pool. Cost is around $2 per wash, and another $2 per dry cycle. The machines take quarters, and a change machine is provided. A small selection of soap, fabric softener, and dryer sheets are also sold, for around $1 each. A typical wash cycle takes 20 to 30 minutes, and a typical dry cycle takes 40 to 50. If you lose something during your stay, contact Disneyland Hotel's Lost and Found department by calling (714) 778-6600. Rated 4.0 out of 5.0 based on 171 reader ratings.